The portable, or bedside, chest radiograph (PCXR) remains the most commonly ordered imaging study, particularly in intensive care unit patients, where valuable information can be gained at a low cost without the risk and expense of patient transport. Despite the widespread use of PCXR, persistent challenges arise in producing value-added interpretations. Compared to standard PA radiographs, exam quality and technique are much more variable. With the advent of picture archiving and communication systems (PACS) and hospital-wide access to images, “X-ray” rounds less commonly include direct consultation with a radiologist. To remain relevant to patient care and provide the best service to referring clinicians, the radiologist’s interpretation of studies and communication of findings must be timely and accurate. With the goal of reducing missed findings, we will review sources of technical and interpretative error in PCXR interpretation. Understanding the sources of error is a necessary first step in error reduction. Errors result from system factors, including technical or equipment limitations, environmental conditions (eg, suboptimal reading room design), workflow issues (eg, interruption, productivity and turn-around time expectations), inefficient communication processes and reader fatigue. Common technical limitations include increased noise from higher scattered dose fraction and lower energy, grid artifacts and geometric distortion from short source to image distances, and beam angulation. Vigilant quality control practices can minimize diagnostic errors related to suboptimal positioning or obscuration of important findings by overlying medical equipment. Despite the best possible effort, patient factors such as obesity, hypoventilation, and motion unsharpness can hinder diagnostic interpretation. Effective quality assurance programs can minimize errors attributable to preventable technical factors. Understanding the unique technical aspects of data acquisition and image processing associated with digital radiography (DR) and computed radiography (CR) systems is part of the radiologist’s added value. In general, diagnostic image quality is maintained over a wide range of exposure parameters requiring lower radiation doses compared to analog film due to higher detector efficiency. Underpenetration continues to be problematic, particularly in the lower chest, where abdominal soft tissues attenuate photons with a proportional increase in image noise. Overpenetrated images are difficult to identify unless the applied dose exceeds 10 times the appropriate level producing detector saturation. With this wide dynamic range, technologists may preferentially select higher exposure settings to avoid repeat exams, a phenomenon described as exposure factor creep or dose drift. Following data acquisition, image post-processing generates the final image introducing new pitfalls. For each image, a histogram of the image density range is created; the optimal latitude and contrast values are chosen using a set of anatomy-specific reference parameters. Diffuse, symmetrically attenuating abnormalities can be ‘normalized’ as the system processes to the closest approximation of the anatomic reference parameters.11 Similarly, when abnormalities are bilateral and asymmetric, the side that attenuates less may be normalized. This is a reported explanation for some of the decreased sensitivity in detection of pleural fluid in recumbent/supine patients (Figure 1). Many artifacts unique to DR and CR acquisitions have been discussed in a recent review.12 Backscatter artifacts are particularly problematic for portable radiography where cassette shielding is minimized to decrease the cassette weight. 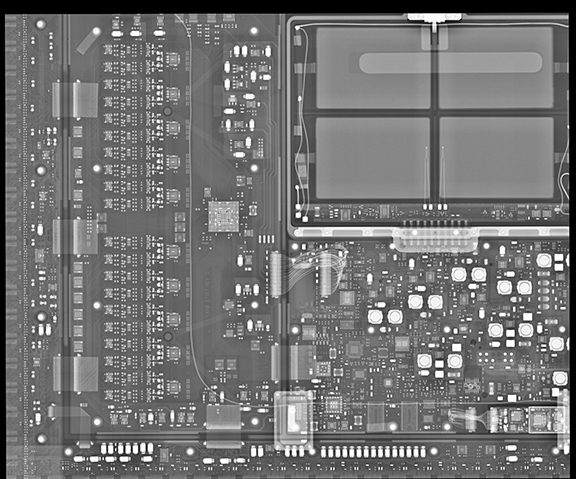 When high exposures penetrate the shielding, the detector’s electronic components reflect radiation back into the image (Figure 2). Lighting conditions in reading rooms affect image contrast and lesion conspicuity. The dark conditions needed to optimize image contrast for hard-copy interpretation are less critical with electronic displays. Interpretation of images on LCD monitors may allow for brighter ambient conditions without loss in diagnostic accuracy and may reduce visual fatigue.13 Further research is necessary to establish standardized ambient conditions for modern PACS reading rooms. While the impact on diagnostic radiology is not well understood, interruptions have been implicated in many types of medical errors by the Institute of Medicine report, To Err is Human.14 Telephone and pager systems are highly disruptive. A recent paper addressing phone disruptions on call found the median time between calls in one academic practice ranged from 3-10 minutes, depending on the time of day.15 Increased frequency of phone calls may negatively influence accuracy of preliminary reports for on-call radiology residents.16 Complex studies necessitate longer interpretation times increasing the likelihood of disruption. One author has suggested that interruptions may benefit the radiologist by providing a break from the monotony of continuously updating worklists.17 For PCXR interpretation, reader fatigue from repetition is perhaps more likely to produce errors than interruptions. Eye strain and visual fatigue have been shown to decrease diagnostic accuracy and reduce productivity.18 With increased demand for fast turn-around times, radiologists have become victims of their own success. Comparison with immediate and older images requires time and larger workstations but may lead to fewer missed abnormalities; comparison images have been reported to increase the detection rate of findings by up to 20% (Figure 3).19 Comparison images increase confidence and result in greater diagnostic specificity. Despite vigilant PCXR review, interpreters will “miss” relevant findings. A study of general radiologists reports miss rates of 3-5%.20,21 Perception is purportedly the greatest contributor to error and yet is the least well understood.22 Studies of perception in radiographic interpretation have suggested many true positive abnormalities are perceived in the first few seconds of image review before initiation of a search and is a function of reader experience.23,24 The second phase includes scanning of the image for abnormalities, followed by a period of decision-making. Focused attention on a particular area of a radiograph (visual dwell) is associated with both increased false positive and false negative findings. Observer-level errors can be classified as scanning or search errors (don’t look at it), recognition errors (don’t see it), or decision-making errors (don’t understand it).25 The remainder of this article will address observer errors in PCXR interpretation. 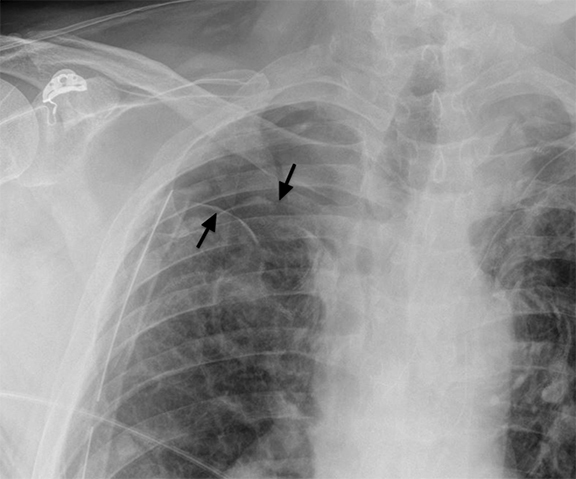 A frequent and appropriate indication for portable chest radiography is the placement of a new medical device and associated complications. Device malposition may be clinically inapparent; for this reason, indwelling devices should be systematically evaluated with each study. Requiring the technologist to reposition any overlying wires and tubing will facilitate this review (Figure 4). Commonly overlooked and/or critically important abnormalities in each category will be described. The ideal position of an endotracheal tube (ETT) is 4-6 cm above the carina. Mainstem bronchial intubation occurs in up to 10% of intubation attempts and is typically readily identified. The likelihood of esophageal intubation increases with emergent situations, class III/IV airways (Modified Mallampati), and level of training of the intubator. A recent review of emergency intubations performed by anesthesia trainees at a large university found difficulty in placing the ETT in 10% with a 4% complication rate.26 Esophageal intubation is easily missed and emphasizes the importance of reviewing the entire course of each tube. Esophageal intubation should be suspected if any portion of the ETT projects outside the confines of the airways (Figure 5). Severe gaseous gastric distension or poorly inflated lungs may be the only clues to tube malposition. Complications after central line placement include pneumothorax, hematoma and catheter malposition. Ideal position depends on the intended use of the catheter, but as a general rule the tip should reside in a large, central vein, preferably the lower half of the SVC, with its course parallel to the long axis of the vein. While complications from central line placement have decreased with the use of point-of-care ultrasound for direct venipuncture site visualization, catheter malposition is reported in up to 40% patients27 and occurs with higher frequency with a left-sided approach. In general, left-sided catheters should cross midline and right-sided catheters should not cross midline; catheters failing this rule should be investigated with additional projections, review of prior imaging, blood gas analysis, or waveform transduction to exclude extravascular or arterial placement. In the specific case of pulmonary artery (PA) catheters, peripheral positions may result in pulmonary infarct or balloon-related vascular injury. A PA catheter should terminate proximal to the interlobar pulmonary artery (ILA). A position within 2 cm of the hilum has been described as acceptable,27 although this fails to account for the proximal origin of small segmental right middle lobe and lingular pulmonary arteries (Figure 6). Malposition occurs in 1-1.5% of gastric/enteric tubes. The side port of a gastric tube should be below the level of the gastroesophageal junction; weighted feeding tubes should extend to the second portion of the duodenum. Both should be confirmed by radiograph before use. The entire course of the enteric tube must be verified to follow the expected course of the upper gastrointestinal track; distal tip location alone is insufficient. An enteric tube inadvertently placed into the tracheobronchial tree may be advanced through the lung parenchyma and visceral pleural. 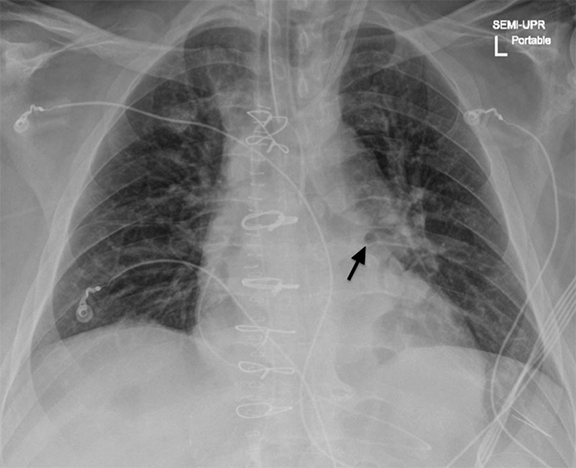 In this instance, a tube in the posterior pleural space may simulate an infradiaphragmatic tube with catastrophic consequences. Large thoracostomy tubes or pleural pigtail catheters may be used to evacuate fluid or gas. 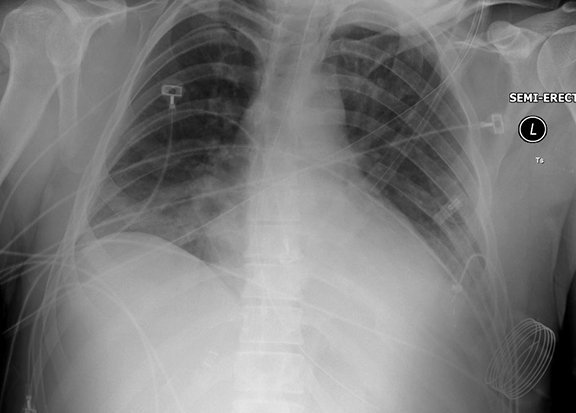 Whether a straight or pigtail catheter, the side-ports of the tube should reside within the inner margin of the ribs. Tubes directed toward the hila may be fissural. 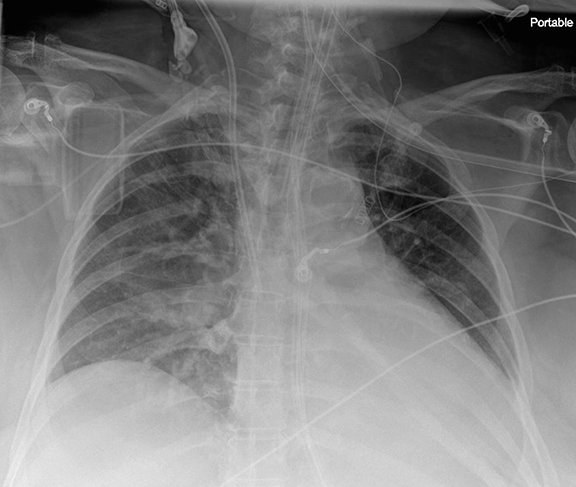 Chest tube malposition must be suspected when pleural collections fail to drain. 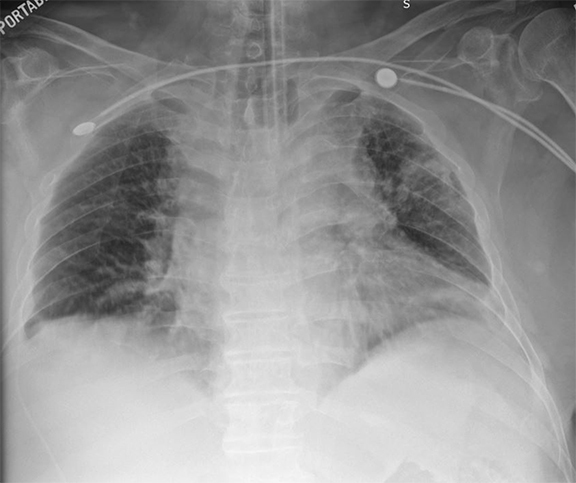 When the adjacent lung is expanded and free of consolidation, at least one edge of the chest tube should be visible if it is intrapleural (obscured outer edge sign).28 As with enteric tubes, the entire course of the chest tube should be evaluated. If any portion of the tube projects outside the pleural space distal to the pleural entry site, the entire tube is extrapleural. 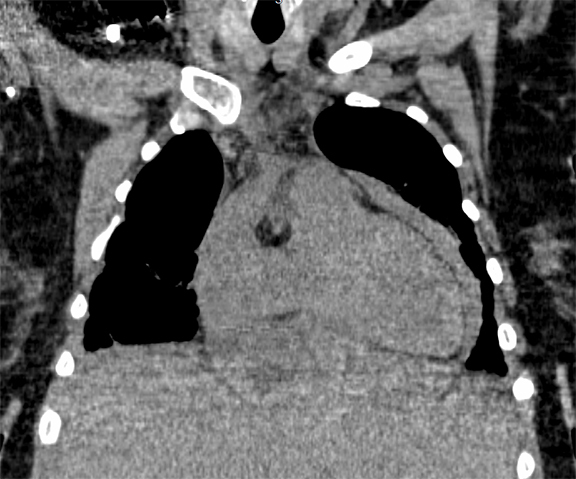 While rarely necessary, CT may be helpful to confirm tube position and any associated injuries (Figure 7). 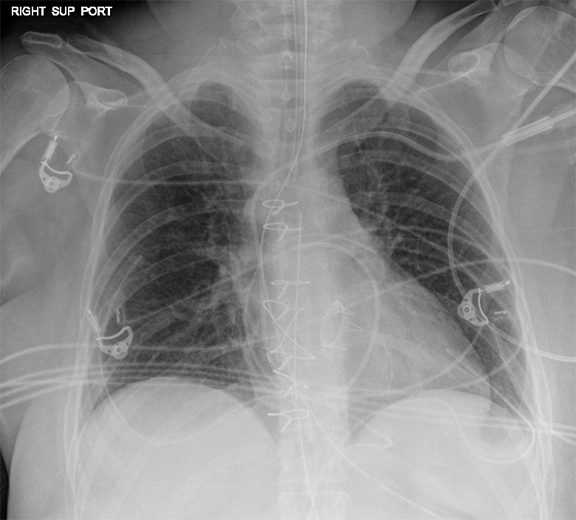 Airspace processes can be difficult to characterize on portable chest radiography, and patterns are often overlapping. Narrowing the differential diagnosis requires an understanding of the clinical presentation. Aspiration, a common occurrence in ICU patients, and pneumonia, a common clinical query, will be addressed. Aspiration is an under-appreciated and clinically important source of airspace opacity in ICU patients. Aspiration can lead to a chemical pneumonitis and is a known risk factor for the development of acute respiratory distress syndrome (ARDS). In a prospective study of critically ill patients, nearly 90% of patients had pepsin in BAL samples, a surrogate marker of inhaled gastric contents.29 The diagnosis of aspiration can be challenging, as most events are un-witnessed and patients are sedated. At PCXR, aspiration occurs in a dependent distribution that varies with patient position; in the supine patient this is most often perihilar and asymmetric in the superior segments of the lower lobes and posterior segments of the upper lobes. The B6 bronchus sign is useful in the detection of superior segment, lower lobe air space disease (Figure 8). Radiographic findings may lag clinical symptoms. Pneumonia in ventilated patients is relatively common, occurring in 9-21%. The reported sensitivity of new or worsening opacity is reported to be 50-78% and air bronchograms, 58-83%, however interobserver reliability is low.30 Specificity is also low and no particular finding or combination of findings is an accurate predictor of ventilator-associated pneumonia. Correlation with protected bronchial brushing cultures, PCXR has a positive predictive value of 0.35 and negative predictive value of 0.55.31 Detection of new parenchymal abnormalities is more challenging in the setting of critically ill patients with ARDS. 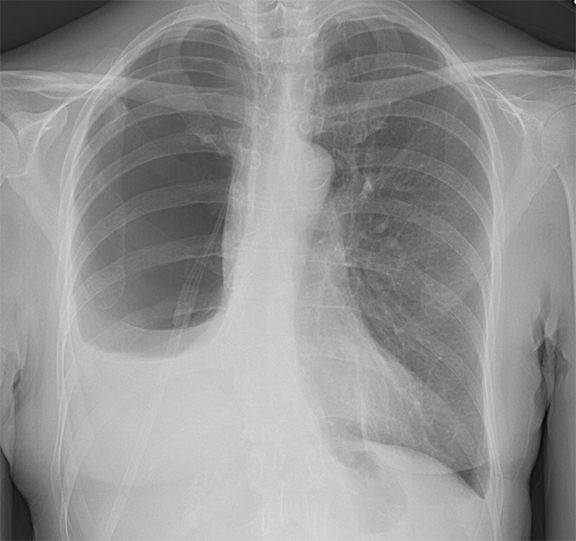 In ventilated patient with ARDS, the accuracy of PCXR is reduced to 30-50%.32 In patients with diffuse lung abnormalities associated with ARDS, there is usually minimal day-to-day change; therefore, abrupt or gradual worsening lung opacity over serial exams may indicate a nosocomial infection. 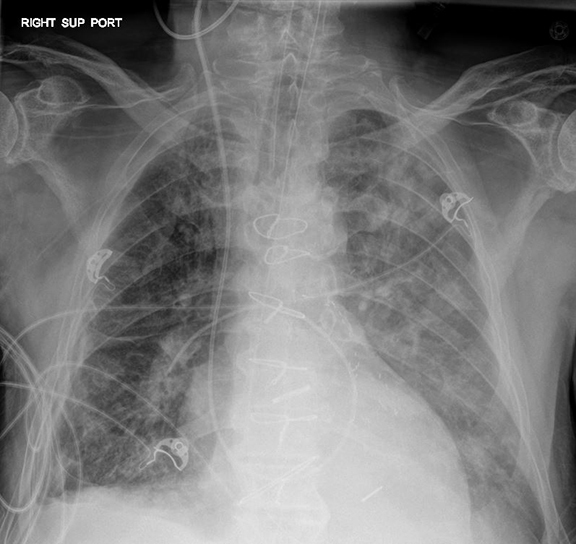 Pleural effusions are common in ICU patients. Detection of pleural findings depends highly on patient position. Free-flowing fluid first accumulates in the posterior costophrenic sulcus, a location frequently occult in semi-recumbent patients. Typical findings of posteriorly layering pleural fluid include a subtle gradient of opacity in the lower chest, blunting of the lateral sulci, loss of a perceptible diaphragm, and loss of vascular marking below the diaphragm. 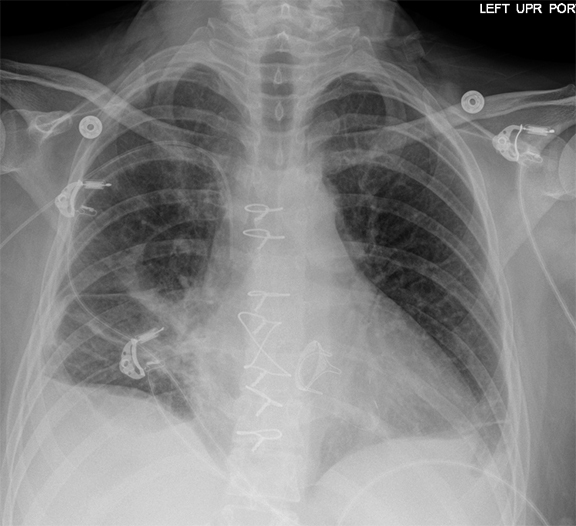 An apical cap may be seen in supine patients.33 Supine radiographs are only moderately sensitive (70%) and specific (67%) for pleural fluid, with costophrenic angle blunting being the most frequent and least specific sign.34 As much as 500 mL of pleural fluid may be necessary for radiographic detection,35 and accurate estimation of pleural effusion size with supine PCXR is difficult. Atelectasis, consolidation, and superimposed abdominal or breast tissue may all mimic layering pleural fluid. As previously mentioned and worth emphasizing, digital post processing can normalize symmetric attenuation, masking considerable pleural fluid. As with pleural fluid, pleural air can be difficult or impossible to detect by PCXR. 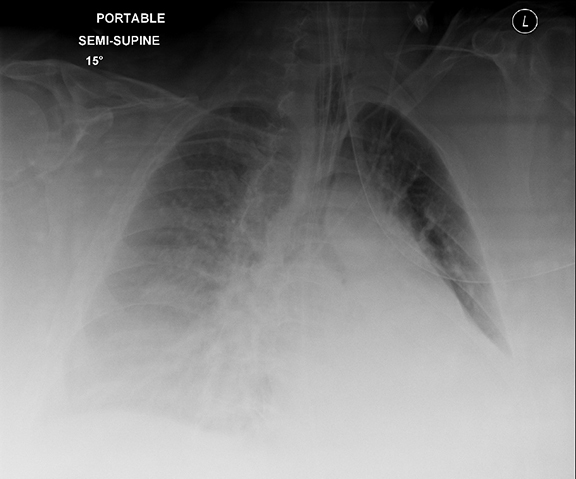 Occult pneumothorax (OPTX) has been described in 29-72% of trauma patients correlating PCXR with contemporaneous CT.36 Sensitivity improves considerably with semi-upright positioning.37 In supine patients, pleural air tends to collect in the non-dependent portion of the pleural space, namely the anteromedial and subpulmonic recesses. In one study, only 22% of supine and semirecumbant patients had a visible apicolateral pleural line, while 38% had anteromedial and 26% subpulmonic collections.38 Lower lobe collapse is associated with posteromedial PTX.39 In addition to a visible visceral pleural line, additional findings of a pneumothorax in a supine patient include a deep sulcus, increased conspicuity of the cardiac apex or fat pad, abnormally lucent medial sulcus, the double diaphragm sign, and depressed ipsilateral diaphragm. Patients who have undergone cardiothoracic surgery present additional challenges in PCXR interpretation. Changes in the position of normal structures and surgical alterations can mimic pathology (Figure 9). Correlation with operative reports and pre-operative imaging is crucial. Subtle imaging findings may be the first clue of a post-operative complication. 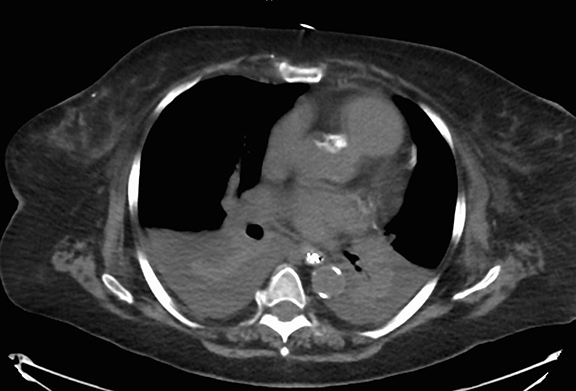 Mediastinal hemorrhage is an important diagnosis that may be detected radiographically. Re-exploration for suspected bleeding occurs in up to 3-5% of patients of after cardiac surgery.41 While the decision to re-explore is influenced largely on clinical parameters (instability and clinical/laboratory findings of blood loss), early detection may improve outcomes. Prolonged time to re-exploration has been associated with increased mortality.42 While post-operative patients typically have a wider mediastinum compared to their pre-operative examinations, an increase in mediastinal width of greater than 70% suggests mediastinal hemorrhage that requires exploration.43 An apical cap is another finding of large-volume mediastinal hemorrhage. Portable chest radiographs are a commonly ordered examination that can be challenging to interpret. While routine morning chest radiographs were once thought to be best for patient care, more restricted use is recommended in the ACR Appropriateness Criteria and may provide equivalent patient outcomes with increased diagnostic efficacy and cost savings. Understanding the technical nuances of digital imaging acquisition and post-processing prevents potential misinterpretations, such as “normalization” of layering pleural effusions. Careful assessment of the course and termination of support devices will reduce recognition errors. Aspiration particularly in the superior segments of the lower lobes is an under-recognized cause of airspace opacities in ICU patients and may lead to nosocomial pneumonia. Although PCXR is relatively insensitive for pleural abnormalities, attention to patient positioning may improve detection. Finally, interpretation of postsurgical images adds challenges related to altered anatomy, changing surgical techniques, and recognizing the spectrum and time course of complications. Strict attention to the principles outlined in this article should decrease technical and observer errors associated with PCXR interpretation. Greenbaum DM, Marschall KE. The value of routine daily chest x-rays in intubated patients in the medical intensive care unit. Crit Care Med. 1982; 10(1):29-30. Henschke CI, Pasternack GS, Schroeder S, et al. Bedside chest radiography: diagnostic efficacy. Radiology. 1983; 149(1):23-26. Janower ML, Jennas-Nocera Z, Mukai J. Utility and efficacy of portable chest radiographs. AJR Am J Roentgenol. 1984; 142(2):265-267. Bekemeyer WB, Crapo RO, Calhoon S, et al. Efficacy of chest radiography in a respiratory intensive care unit. A prospective study. Chest. 1985; 88(5):691-696. Graat ME, Choi G, Wolthuis EK, et al. The clinical value of daily routine chest radiographs in a mixed medical-surgical intensive care unit is low. Crit Care. 2006; 10(1):R11. Hejblum G, Chalumeau-Lemoine L, Ioos V, et al. Comparison of routine and on-demand prescription of chest radiographs in mechanically ventilated adults: a multicentre, cluster-randomised, two-period crossover study. Lancet. 2009; 374(9702):1687-1693. Lakhal K, Serveaux-Delous M, et al. Chest radiographs in 104 French ICUs: current prescription strategies and clinical value (the RadioDay study). Intensive Care Med. 2012; 38(11):1787-1799. Tolsma M, Rijpstra TA, Schultz MJ, et al. Significant changes in the practice of chest radiography in Dutch intensive care units: a web-based survey. Ann Intensive Care. 2014; 4(1):10. Berlin L. Accuracy of diagnostic procedures: has it improved over the past five decades? AJR Am J Roentgenol. 2007; 188(5):1173-1178. Amorosa JK, Bramwit MP, Mohammed TL, et al. ACR appropriateness criteria routine chest radiographs in intensive care unit patients. J Am Coll. Radiol 2013; 10(3):170-174. Chotas HG, Ravin CE. Digital chest radiography with storage phosphor systems: potential masking of bilateral pleural effusions. J Digit Imaging. 1992; 5(1):14-19. Walz-Flannigan A, Magnuson D, Erickson D, et al. Artifacts in digital radiography. AJR Am J Roentgenol. 2012;198(1):156-161. Pollard BJ, Samei E, Chawla AS, et al. The effects of ambient lighting in chest radiology reading rooms. J Digit Imaging. 2012;25(4):520-526. Kohn LT, Corrigan J, Donaldson MS. To Err Is Human : Building A Safer Health System. Washington, D.C.: National Academy Press; 2000:287. Yu JP, Kansagra AP, Mongan J. The radiologist’s workflow environment: evaluation of disruptors and potential implications. J Am Coll Radiol. 2014; 11(6):589-593. Balint BJ, Steenburg SD, Lin H, et al. Do telephone call interruptions have an impact on radiology resident diagnostic accuracy? Acad Radiol. 2014;21(12):1623-1628. Berlin L. Multitasking, interruptions, and errors. AJR Am J Roentgenol. 2012; 198(1):W89. Reiner BI, Krupinski E. The insidious problem of fatigue in medical imaging practice. J Digit Imaging. 2012;25(1):3-6. Aideyan UO, Berbaum K, Smith WL. Influence of prior radiologic information on the interpretation of radiographic examinations. Acad Radiol. 1995; 2(3):205-208. Borgstede JP, Lewis RS, Bhargavan M, et al. RADPEER quality assurance program: a multifacility study of interpretive disagreement rates. J Am Coll Radiol. 2004;1(1):59-65. Siegle RL, Baram EM, Reuter SR, et al. Rates of disagreement in imaging interpretation in a group of community hospitals. Acad Radiol. 1998;5:148-154. Krupinski EA. Current perspectives in medical image perception. Atten Percept Psychophys. 2010;72(5):1205-1217. Christensen EE, Murry RC, Holland K, et al. The effect of search time on perception. Radiology. 1981;138(2):361-365. Nodine CF, Kundel HL. Using eye movements to study visual search and to improve tumor detection. Radiographics . 1987; 7(6):1241-1250. Kundel HL, Nodine CF, Krupinski EA. Searching for lung nodules. Visual dwell indicates locations of false-positive and false-negative decisions. Invest Radiol. 1989; 24(6):472-478. Martin LD, Mhyre JM, Shanks AM, et al. 3,423 emergency tracheal intubations at a university hospital: airway outcomes and complications. Anesthesiology. 2011; 114(1):42-48. Trotman-Dickenson B. In: McLoud TC, Boiselle P, eds. Thoracic Radiology: the Requisites. Philadelphia, PA: Mosby Elsevier; 2010:136-159. Webb WR, Godwin JD. 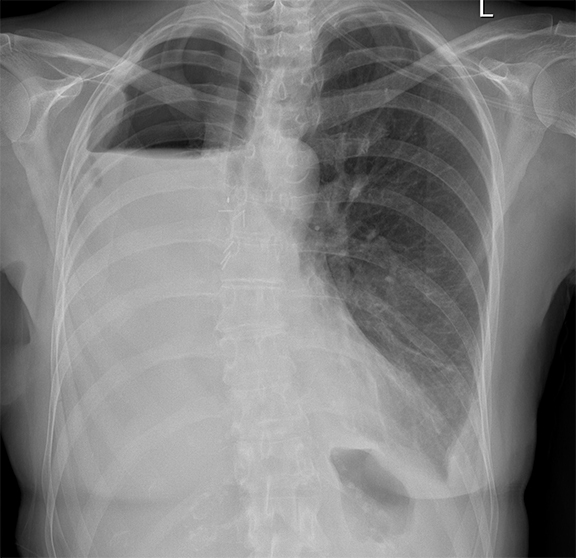 The obscured outer edge: a sign of improperly placed pleural drainage tubes. AJR Am J Roentgenol. 1980; 134(5):1062-1064. Metheny NA, Clouse RE, Chang YH, et al. Tracheobronchial aspiration of gastric contents in critically ill tube-fed patients: frequency, outcomes, and risk factors. Crit Care Med. 2006; 34(4):1007-1015. Wunderink RG. 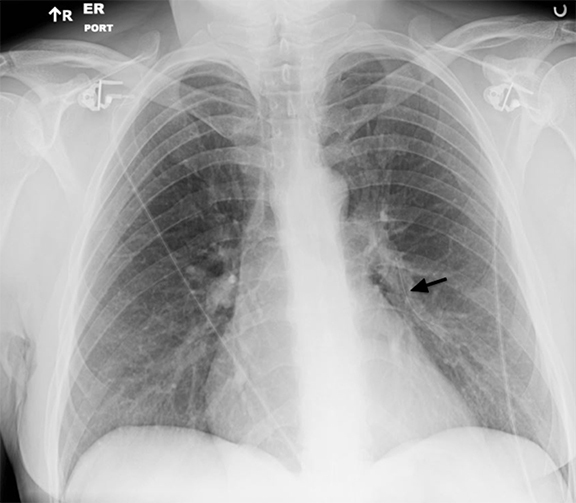 Radiologic diagnosis of ventilator-associated pneumonia. Chest. 2000; 117(4):188S-190S. Lefcoe MS, Fox GA, Leasa DJ, et al. Accuracy of portable chest radiography in the critical care setting. Diagnosis of pneumonia based on quantitative cultures obtained from protected brush catheter. Chest .1994; 105(3):885-887. Winer-Muram HT, Rubin SA, Ellis JV, et al. Pneumonia and ARDS in patients receiving mechanical ventilation: diagnostic accuracy of chest radiography. Radiology. 1993; 188(2):479-485. Raasch BN, Carsky EW, Lane EJ, et al. Pleural effusion: explanation of some typical appearances. AJR Am J Roentgenol. 1982; 139(5):899-904. Ruskin JA, Gurney JW, Thorsen MK, et al. 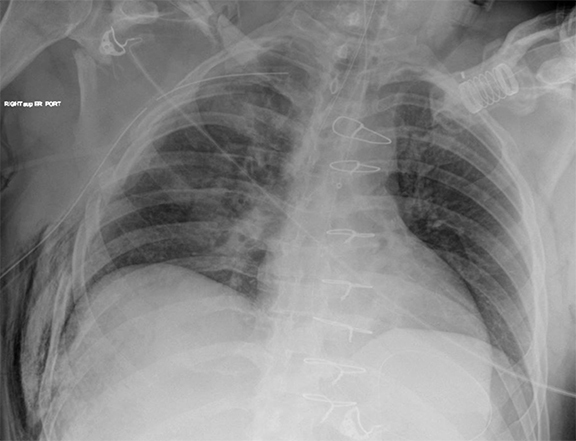 Detection of pleural effusions on supine chest radiographs. AJR Am J Roentgenol. 1987; 148(4):681-683. Woodring JH. Recognition of pleural effusion on supine radiographs: how much fluid is required? AJR Am J Roentgenol. 1984; 142(1):59-64. Omar HR, Mangar D, Khetarpal S, et al. Anteroposterior chest radiograph vs. chest CT scan in early detection of pneumothorax in trauma patients. Int Arch Med. 2011; 4:30. Ball CG, Kirkpatrick AW, Feliciano DV. 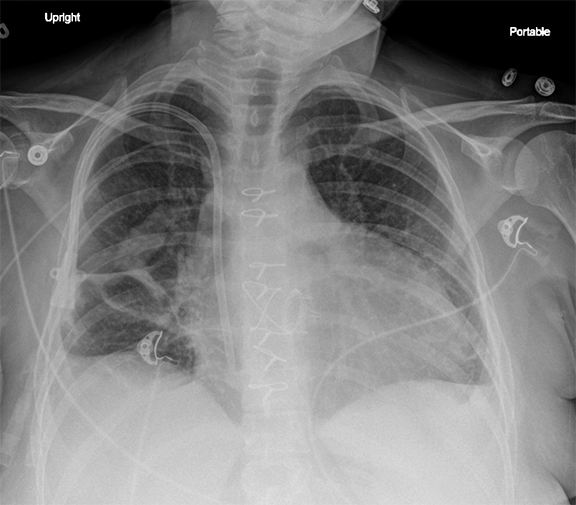 The occult pneumothorax: what have we learned? Can J Surg. 2009; 52(5):E173-179. Tocino IM, Miller MH, Fairfax WR. Distribution of pneumothorax in the supine and semirecumbent critically ill adult. AJR Am J Roentgenol. 1985; 144(5):901-905. 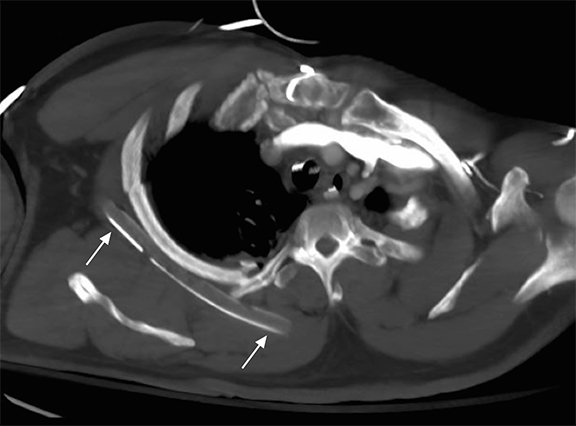 Lams PM, Jolles H. The effect of lobar collapse on the distribution of free intrapleural air. Radiology. 1982; 142(2):309-312. Chasen MH. Practical applications of Mach band theory in thoracic analysis. Radiology. 2001; 219(3):596-610. Pelletier MP, Solymoss S, Lee A, et al. Negative reexploration for cardiac postoperative bleeding: can it be therapeutic? Ann Thorac Surg. 1998; 65(4):999-1002. Čanádyová J, Zmeko D, Mokráček A. Re-exploration for bleeding or tamponade after cardiac operation. Interact Cardiovasc Thorac Surg. 2012; 14(6):704-707. Katzberg RW, Whitehouse GH, deWeese JA. 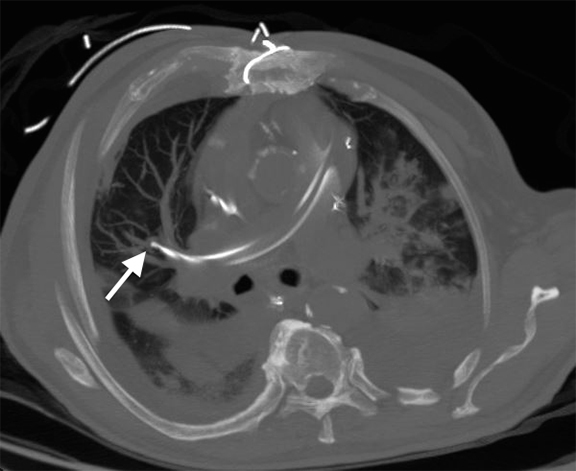 The early radiologic findings in the adult chest after cardiopulmonary bypass surgery. Cardiovasc Radiol. 1978; 1(4):205-215. Christiansen KH, Morgan SW, Karich AF, et al. Pleural space following pneumonectomy. Ann Thorac Surg. 1965; 122:298-304. Merritt RE, Reznik SI, DaSilva MC, et al. Benign emptying of the postpneumonectomy space. Ann Thorac Surg. 2011; 92(3):1076-1081.; discussion 1081-1072. Gelvez-Zapata S, Manley K, Levai I, et al . Benign emptying of postpneumonectomy space due to severe dehydration. Ann Thorac Surg. 2013; 95(3):1088-1089. Reducing errors in portable chest radiography. Appl Radiol. Dr. Jensen is a Assistant Professor at the University of Utah, Salt Lake City, UT, and Dr. Meyer is a Professor at the University of Wisconsin-Madison, School of Medicine and Public Health, Madison, WI.